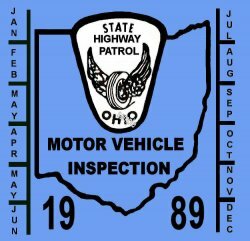 1989 Ohio inspection sticker - $20.00 : Bob Hoyts Classic Inspection Stickers, Add a Final Touch to your Restoration! This 1989 Ohio inspection sticker is like others in years before and after except for the color. We have reproduced what we believe to be a very accurate color.